Innovation for Emerging Smart Cities. By leveraging the Internet of Things (IoT), municipalities can transform their water systems into open communications systems, enabling them to improve the service they offer their customers and increase the connectivity of all city services. 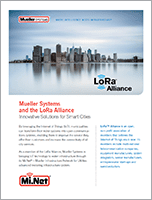 As a member of the LoRa Alliance, Mueller Systems is bringing IoT technology to water infrastructure through its Mi.Net® – Mueller Infrastructure Network for Utilities advanced metering infrastructure system. LoRaWAN is a Low Power Wide Area Network (LPWAN) specification intended for wireless battery operated devices in regional, national or global networks. It is designed to provide features specifically needed to support low-cost, mobile, secure bi-directional communication for the IoT, including Smart City applications. It is optimized for low power consumption and to support large networks with millions of devices. It has innovative features, supports redundant operations, location, low-power and can even run on energy harvesting technologies enabling the mobility and ease of use to IoT. LoRa™ Alliance is an open, non-profit association of members that believes the Internet of Things era is now. Its members include multi-national telecommunication companies, equipment manufacturers, system integrators, sensor manufacturers, entrepreneurial start-ups and semiconductors.